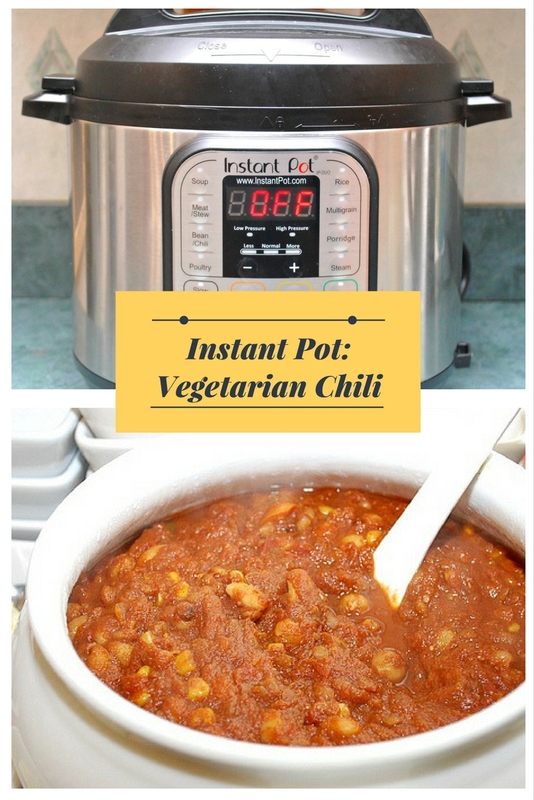 Instant Pot vegetarian chili is the perfect fall comfort food recipe, made easily in your Instant Pot pressure cooker! If you want to sneak in some veggies for your family, chili's the way to do it. When I thought about what to prepare for the recent potluck we hosted for Joel's playdate friends, I knew I wanted to incorporate some vegetables into my dish to sneak in some healthy eats. Chili is one of my favorite ways to do just that since everything gets mixed together, seasoned and served up. 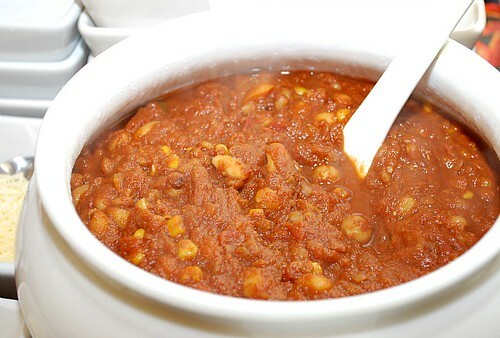 This Vegetarian Chili is full of various legumes, veggies and a whole lot of flavor that you won't miss the beef found in traditional chili! What I had was lentils, garbanzo beans and white great Northern beans. In they went and while I was in the pantry, I thought some pumpkin puree would add a nice subtle sweetness... so that went in too. Finally, it was time to check on it and yes! It came out better than I could have expected... and even my husband loved it! The guy that scrunches up his face at most healthy dishes actually liked enough to have it for lunch 2 days in a row. That my friends is a sign of a healthy recipe winner! Press MANUAL and add oil. Add the onions, garlic, chili powder, cumin, and 1/4 teaspoon salt and cook until the onions are softened and start to brown. Stir in the remaining ingredients until evenly combined. Press CHILI and adjust the time to 15 minutes on HIGH pressure. When the IP beeps after pressure cooking for 15 minutes, turn the setting on top of your IP to VENTING. Doing so allows the IP to quickly release any remaining pressure (also known as QPR or QR). I use a wooden spoon to carefully turn the setting to avoid close contact with the potential steam. You may also want to turn your IP away from cabinets to allow the released steam to escape freely. The pin at the top of your IP will drop when all pressure has been released and it's safe to open. Ladle the soup in bowls and serve with shredded cheese, sour cream, avocado or your favorite garnishes.